The patient only has six upper teeth. Four of the six teeth have traditional crowns that show black metal margins over time. Sinus graft followed by four implants were placed and restored to give patient 10 teeth on the top. In this particular case, the patient does not show her lower teeth when she talks or smiles. 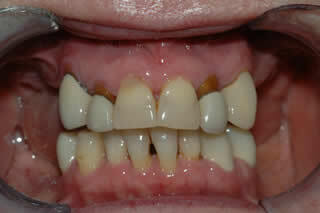 Hence, no treatment except a lower denture was done on lower teeth.